Investing in a commercial fence for your business is a sound financial choice that will pay off with peace of mind and protection of your assets. Your business is more than just your source of income. It’s a dream that you’ve built and nurtured, and like anything else important in your life you feel a driving need to protect it. High-security fencing is a great way to protect not just the physical property of your business, but also the intellectual property and proprietary information that you may have inside, not to mention your employees. Investing in a commercial fence for your business is a sound financial choice that will pay off with peace of mind, and protection for your assets. A high-security fence is a good way to control who comes and goes on your property, especially if you pair it with an automated gate system. Without a proper fence, people might be able to access your property from various directions and without your knowledge. Once your fence is installed, you will be able to limit and monitor where people can enter, and who can go where on your property. Fencing isn’t just for your perimeter either. Consider installing fencing inside the property to designate any areas that require even more access control. Your high-security fencing might also double as a privacy fence. With the proper height and material of the fence, a high-security fence might be able to keep most of your property from view. Depending on your industry, this could be very important. If you have clients who demand confidentiality (if you’re a lawyer or a private investigator, for instance), the fence will ensure their privacy. If your manufacturing work or research requires privacy from prying eyes, on the other hand, the right fence can help, and it might even allow your employees to still have windows in their work spaces (an important aspect of workplace design for improved productivity). Simply the presence of high-security fencing is often enough to discourage most thieves and trespassers because the fence makes it harder to gain access without being seen and caught. 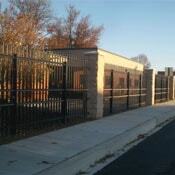 The fence will keep your property safe and secure, and protect your employees, equipment, and possessions inside. If someone is truly intent on breaking in, however, high-security fencing should slow them down long enough to implement other security measures. If you have more questions about winter fence maintenance, Hercules Newport News is here to help you. Winter maintenance can be daunting, but we are here to answer any questions you may have. Our trained professionals have experience in wood, aluminum, chain link, steel, and vinyl fences. We have offices in Manassas, Richmond, Newport News, Norfolk, Maryland, and North Carolina. Get a free quote today and give us a call at 757-316-2600 or visit us online. This entry was posted on Friday, February 8th, 2019 at 3:26 pm. Both comments and pings are currently closed.